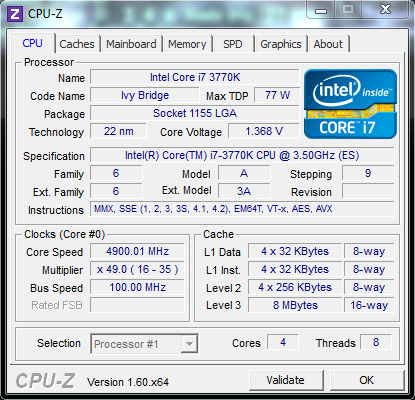 The Intel Core i7-3770K averaged 25.2% lower than the peak scores attained by the group leaders. This isn't a great result which indicates that there are much faster alternatives on the comparison list. The range of scores (95th - 5th percentile) for the Intel Core i7-3770K is 29.5%. This is a relatively narrow range which indicates that the Intel Core i7-3770K performs reasonably consistently under varying real world conditions. Typical Core i7-3770K Builds (Compare 6,331 builds) See popular component choices, score breakdowns and rankings. Still an acceptable processor to use if you intend to pair it with a 1060 level gpu or lower. However, it seriously shows its age in newer gaming titles when compared to the newer gen cpus. For example, I have a GTX 1060 6GB and at the stock clock an i5 8600K performs 58% better (relative to fps using i7 3770k) in games where its cpu bound and 30 something % when its gpu bound. It's 2018, it's still rocking latest titles with about 20% power excess for anything else i would like to do while gaming. Pair it with decent GPU, give it some good RAM, get the OS on SSD and you are pretty much ready to play latest titles on 2012 component for 1/4th of original price. I don't feel need to upgrade to any other 4-core i7 as there is simply no need to, maybe the 8th gen i7 is a game changer, but it has more cores. In general i would recommend. "On a per-core level, there isn't a faster processor available. And with four cores and eight threads, there's multi-threaded performance to burn." "It's just not much quicker than the processor it replaces (i7-2600k). It's also not dramatically more power efficient and doesn't overclock any better." Owned since 2012, it matches the new high-end processors with far less money to spend. definitely a must-have. Equipped with a Noctua NH U12P SE2, ran it at 4.5 Ghz flawlessly. But it's not necessary as the base speed is enough. Also, If you still have an old mid-end graphic card, that could be a CPU to consider.... For the new ones, 4K is easily accessible. Has been working fantastic for 5 years now, and still going strong. Overclocked to 4.5 GHz for the win! One of the best processors back in its day, but Intel definitely made you pay for it. My biggest complaint is the move to using TIM instead of soldering the die to the IHS like they did with Sandy Bridge. Sure, the move to 22 nm made them slightly more efficient, but temperatures still suffered, particularly when overclocked. I can get 4.6+ GHz out of mine, but it starts to get very hot, very quickly, even at less than 1.3V. I've never delidded it, but I'm certainly thinking about it nowadays since I really no longer use it. If I had done a little more research, I might have bought a 2600K or 2700K instead, or waited for Haswell and the 4770K (or even 4790K another year later) with their further improved IPC and better iGPU (not that I really use it). Overall, it's hard to say too many bad things about Intel's processor lineup from about 2011-2016 or so since AMD basically wasn't competitive with their Bulldozer/Piledriver (FX-series) processors. Only in the last couple of years, thanks to AMD's Ryzen, can we see how Intel was grossly exploiting consumers. It also didn't help AMD that Intel was employing illegal, anti-competitive business tactics in the years prior, even when AMD was quite competitive and held the performance crown over Intel. The i7-3770K is the best processor you can buy for LGA1155 socket. With 4 cores and 8 threads, this processor still handles gaming and streaming very well. Apart from it's great overclocking capabilities, the age of the processor is beginning to show. Since the processor was made for older motherboards, compatibility with newer technologies (such as DDR4 Memory and NVMe Solid State Drives for example) is non-existent. While this may not matter for most consumers, for those who want the best value for their money, this processor is not a good choice. However, it can be recommended if you ALREADY own a motherboard capable of overclocking that is compatible with the i7-3770K. If you don't have a motherboard that can overclock the processor, it is recommended that you buy an i7-3770 non 'K' variant, as this will mirror the performance of the 'K' variant. To summarize, there are better, more modern options available that can obtain equal, if not better, performance than the i7-3770K, while supporting newer memory and storage as well as an overall increase in performance in gaming and workstation applications.